Three actions to take before Congress goes on summer break July 31st. 1.) Call and fax your county commissioners to request they stop supporting the resolution pushed through the national NACO meeting to give the states the ability to manage federally protected wild horses and “dispose” of them . Politely let them know you will hold them accountable if wild horses are killed or slaughtered and the states have a heinous history of “taking care of wild horses.” Explain that livestock is causing range damage because cattle and sheep outnumber wild horses more than 50 to 1. Let them know people in all states across the country enjoy wild horses and as a federally protected animal–they belong to everyone. Request a written response from your county commissioners. 2.) Call and fax your representative to politely insist they stop Chris Stewart’s (R-UT) Wild Horse Oversight Act of 2014, H.R. 5058 from gaining any momentum in the House. Explain to them that the Act is misleading and would allow states to dispose of federally protected wild horses by killing them or selling them to slaughter. Request a written response from your representative. 3.) Call and Fax your 2 senators and representative the Declaration by Llyod Eisenhauer, former BLM manager, who states the pending Wyoming Checkerboard Roundup appears to be in violation of the law. Ask your elected officials to stop the Checkerboard Roundup scheduled to begin August 20th. Request a written response from your elected officials. 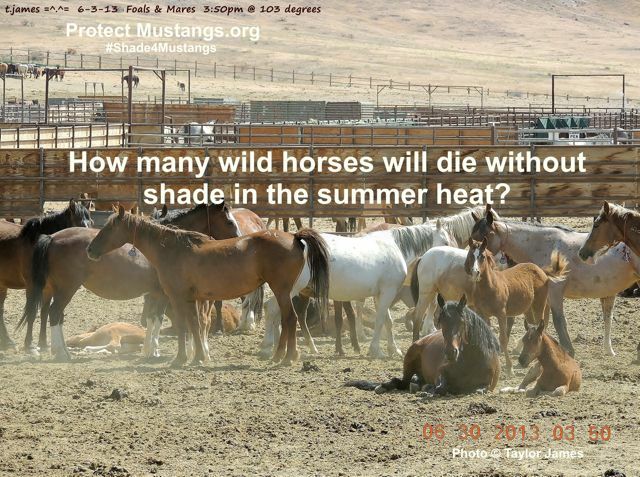 This #MustangMonday, July 8th, we are calling on the good people of America to call and fax their Senators and Representatives asking they intervene to get #Shade4Mustangs at the Palomino Valley Center near Reno, NV. Lead contact for this action is Tami Hottes, Protect Mustangs’ Outreach Coordinator for the Midwest and South.